This report includes results from the breadth of the PSAMP monitoring activities conducted by all the participating agencies. This is a technical report, but it does not include the methodological and analytical detail found in individual agency technical reports. This report attempts to answer the questions of citizens, lawmakers, resource managers and scientists about the condition of Puget Sound’s waters, sediments and its biological resources. The goal of the Puget Sound Update is to provide information that can help readers evaluate current efforts to protect and restore Puget Sound’s water quality and to point out water quality and resource management issues that might require attention now and into the future. PSAMP uses the Puget Sound Update to report on its own results but also to summarize the related work of other researchers in Puget Sound as well as the larger region. The geographic scope of PSAMP is formally the inland marine waters of the State of Washington, including Puget Sound proper, part of the Strait of Juan de Fuca and the southern portion of the Strait of Georgia. In this report, the term Puget Sound is used in a broad sense to represent all these inland marine waters of Washington. In many respects, however, these marine waters of Washington are part of a single larger ecosystem that includes the entire Strait of Georgia in British Columbia (Figure 1-1). This is reflected in this report through a number of monitoring activities that are either transboundary in nature or focus on the Strait of Georgia. Although the marine waters of Washington and British Columbia mix freely, the international border creates an institutional barrier, making it challenging to develop and share information or coordinate management programs concerning the broader ecosystem. To address this, the governor of Washington State and the premier of British Columbia entered into an Environmental Cooperation Agreement in 1992 to foster cooperation and collaboration. The joint publication of the Georgia Basin – Puget Sound Environmental Indicators Report (GBEI 2002) released earlier this year is evidence of this increasing cooperation. Also, next year’s biennial research conference will be an international effort, with joint sponsorship from both sides of the border. The 2003 Georgia Basin–Puget Sound Research Conference will be in Vancouver, British Columbia. Future editions of the Puget Sound Update will no doubt further reflect this growing cooperation. This report is organized around five monitoring topics (see sidebar) that relate to human activities and management programs. Each of the next five chapters of the Update addresses one monitoring topic, beginning with a summary of the issues addressed by the topic and followed by a presentation and discussion of recent findings from PSAMP and other studies. A number of monitoring activities fall into more than one category. Cross-references between chapters are provided where this occurs. Monitoring and research results, as presented in this Puget Sound Update, help regulatory agencies and the Puget Sound community understand how our ecosystem functions and how it responds to human activities and management programs. Through presentation of its findings, PSAMP can raise awareness of problems and issues affecting Puget Sound. In some cases, monitoring results from PSAMP and other studies will indicate the need for additional scientific investigation. In other cases, monitoring results may directly indicate the need for new policies, amended strategies or specific measures to protect and restore Puget Sound resources. Each of the remaining chapters of the Update concludes with a short list of recommendations for acting on the findings presented in the chapter. Puget Sound Water Quality Action Team. 2002. 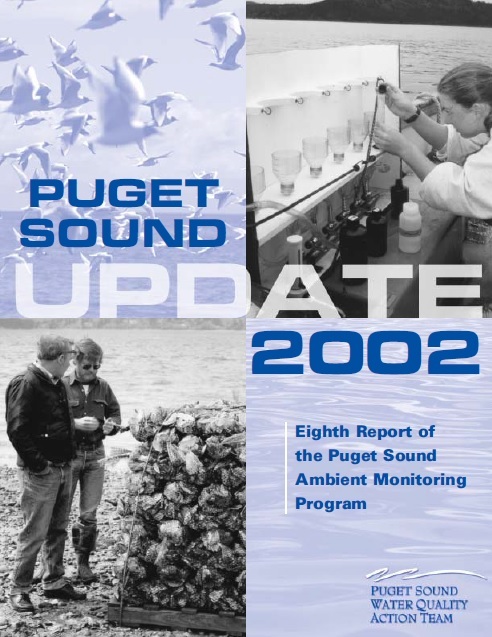 2002 Puget Sound Update: Eighth Report of the Puget Sound Ambient Monitoring Program. Puget Sound Water Quality Action Team. Olympia, Washington.